Released 29th April, Cut Yourself In Half’s new album, ‘Mekkanizm’ is not for the fair-weather rock fan…you have been warned! On first play I wasn’t sure if I even liked this heavy, grinding band that I hadn’t heard of before… on second play I made up my mind that F*** yeah! I do! 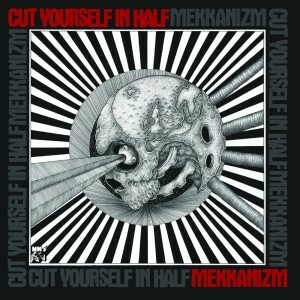 MEKKANIZM is the debut album from Cut Yourself In Half, the latest batch of Yorkshire riff merchants, and frankly these four guys are a metal machine of quite ferocious proportions. Hailing from Bradford, they’ve been honing their chops for the last year, since releasing their download only debut for NHS ‘Say Goodbye ToThe World’. ‘Viracocha’ has a massive Marilyn Mason feel to it, only heavier and grittier. While other tracks, such as ‘Spider Legs’ reminds me of old Faith No More with the volume cranked up of course! Considering I had already made up my mind that these guys were going to be waaaaay over my head before I’d even listened to it, it took just 2 runs to change my mind completely! It will most definitely be on my play list from now on! MEKKANIZM will be unleashed on April 29th.